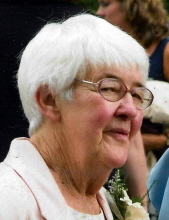 Alice Marie (Doyle) Gawron of East Chatham passed away on January 13, 2019. She was born on February 8, 1928, the daughter of the late George and Doris (Lamoree) Doyle. A 1947 graduate of Chatham High School, she was employed as a stenographer for the State of New York before marrying Edwin Gawron in 1949. She spent the rest of her life as a stay at home mother, enjoying gardening and her pet animals. Alice was active in Columbia County 4-H for over 20 years, and was a leader of the 295ers 4-H Club for over 10 years, teaching sewing, cooking and cattle showmanship. She was a life member of the East Chatham Fire Company Ladies’ Auxiliary, a 75-year member of East Chatham Grange #1066, and was a member of the Dutch Shoes Square Dance Group and the Red Rock Historical Society. Alice was predeceased by her husband, Edwin Gawron and her brother, George Willard Doyle. She is survived by her children: Patricia, Allan (Wanda), Susan (Steven Cipolla), Bernice, and Dennis (Judy), six grandchildren, three great-grandchildren, and several nieces, nephews and cousins. Calling hours will be on Thursday, January 17 from 5-7:00 p.m. at the French, Gifford, Preiter and Blasl Funeral Home in Chatham. A funeral mass will be held on Friday January 18, 10:00 a.m. at St. James Church Chatham. In lieu of flowers, donations may be made to the following: The East Chatham Grange c/o Jolene Pirrone PO Box 69 East Chatham, NY 12060 or the East Chatham Fire Company’s Ladies Auxiliary c/o/Wendy Shatney 3 Braley’s Crossing, East Chatham, NY 12060. Condolences may be conveyed at frenchblasl.com. To send flowers or a remembrance gift to the family of Alice Marie Gawron, please visit our Tribute Store. "Email Address" would like to share the life celebration of Alice Marie Gawron. Click on the "link" to go to share a favorite memory or leave a condolence message for the family.